How to watch Grown Ups (2010) on Netflix India! Sorry, Grown Ups is not available on Indian Netflix, but you can unlock it right now in India and start watching! With a few simple steps you can change your Netflix region to a country like Egypt and start watching Egyptian Netflix, which includes Grown Ups. We'll keep checking Netflix India for Grown Ups, and this page will be updated with any changes. 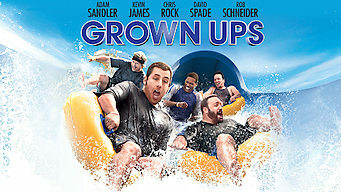 Grown Ups is not available in India BUT it can be unlocked and viewed! Five childhood pals reunite after 30 years at a lake house to mourn the loss of their old basketball coach, and act quite juvenile for their age. Five former high school teammates who never really grew up get a reality check. Can a knucklehead change his spots? There is a way to watch Grown Ups in India, even though it isn't currently available on Netflix locally. What you need is a system that lets you change your Netflix country. With a few simple steps you can be watching Grown Ups and thousands of other titles!